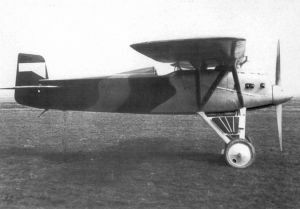 The Avia BH-7 was a prototype fighter aircraft built in Czechoslovakia in 1923. It was a parasol-wing monoplane developed in tandem with and as an alternative to the BH-6, which shared its fuselage and tail design. Like the BH-6, the BH-7 was involved in a number of serious crashes during its test programme, which led to its abandonment as a fighter. Undaunted, however, Avia used the design as the basis for a racing aircraft, shortening the wingspan by 1.4m (4ft 7in) and fairing it directly into the top of the fuselage and dispensing with the cabane struts. This revised version was designated BH-7B and the fighter (retrospectively) as the BH-7A. When the design proved no more successful as a racer it was finally put to rest. Taylor, Michael J. H. (1989). Jane's Encyclopedia of Aviation. London: Studio Editions. pp.86. World Aircraft Information Files. London: Bright Star Publishing. pp.File 889 Sheet 86. Němeček, V. (1968). Československx� letadla. Praha: Na�e Vojsko.